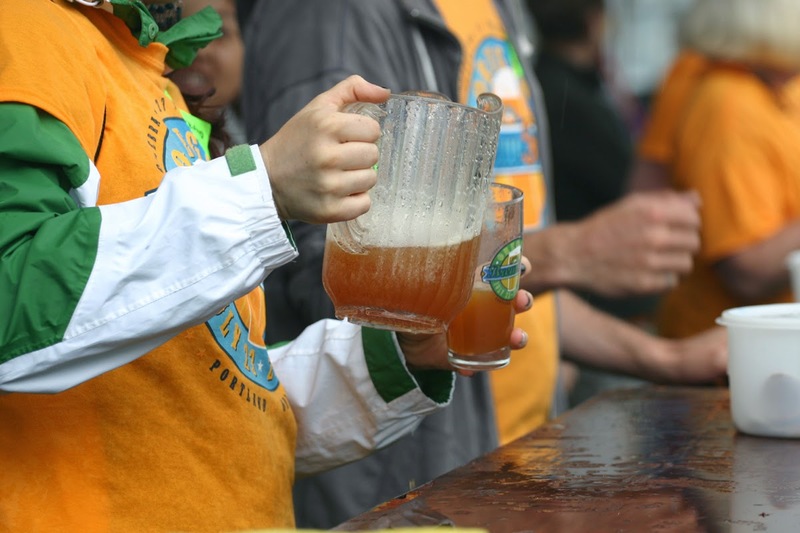 Yesterday's cool, damp opening day at the Oregon Brewers Festival was historic. Never before in the event's history has the weather refused to cooperate on this level. We've seen clouds and cool, for sure, but never steady rain and intermittent downpours. This isn't likely to happen again anytime soon, which makes yesterday historic. The rain and cool temps didn't seem to spoil the mood. However, it was quite odd seeing an OBF crowd dressed in jackets and jeans, sporting umbrellas, and hiding out under the tents to stay dry. Everything is usually geared toward staying cool here. Not yesterday. Festival director Art Larrance kicked things off with his standard talk and intros. 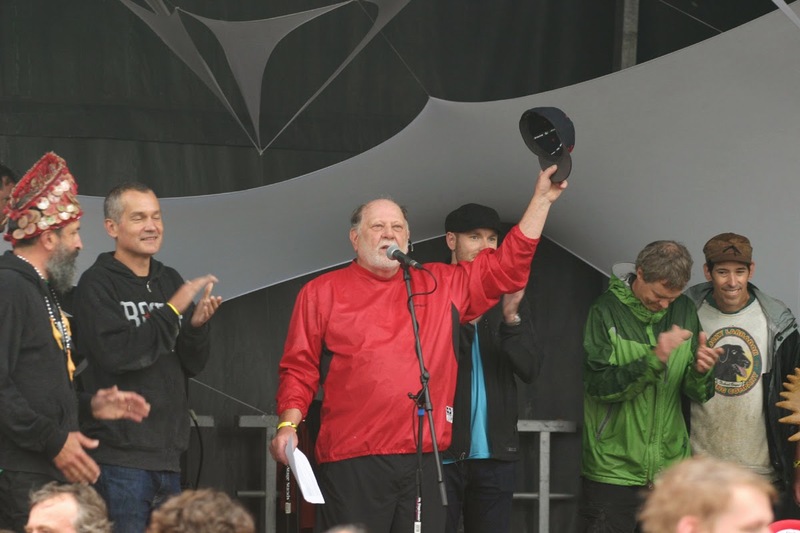 He honored the contributions of the late Jack Joyce, co-founder of Rogue Brewing. Jack was to have been the grand marshal of the festival, leading the parade and tapping the ceremonial first keg. Jack's son, Brett, and Rogue head brewer, John Maier, stood in for their departed leader. Larrance moved on, asking the crowd to pause momentarily to remember Vic Atiyeh, who, as governor, signed Oregon's Brewpub Bill into law in 1985, as well as victims of the recent airline tragedy in the Ukraine. He also introduced the visiting Dutch brewers and talked about the emerging relationship between Portland and Utrecht. Nicely done. Getting around the festival grounds was a bit more challenging than usual due to the mud and umbrella count. 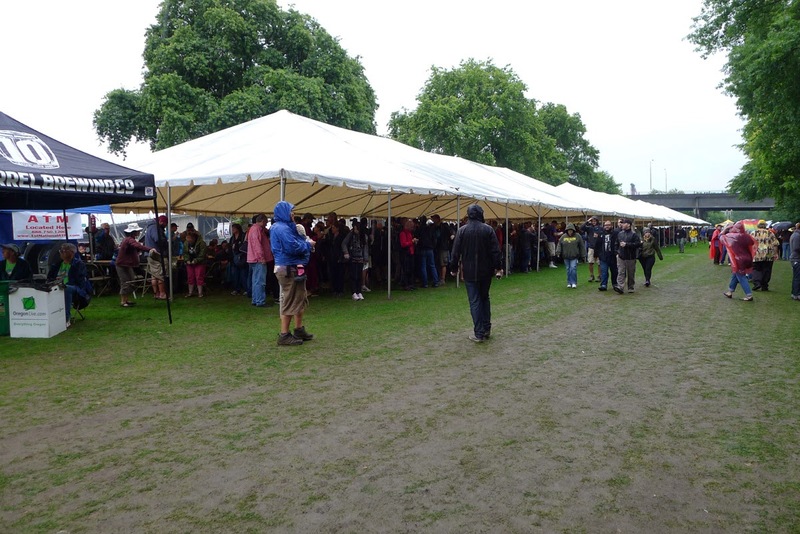 Last year's switch to a smaller tent on the south side, designed to open up the area between the tent and beer taps, resulted in a wide swath of largely unoccupied ground as people sought shelter from the liquid sunshine. It looks like the weather is returning to normal heading into the weekend, and I suspect the mess created by Wednesday's rain will be a forgotten, dried up detail by Friday. That's good news for everyone. 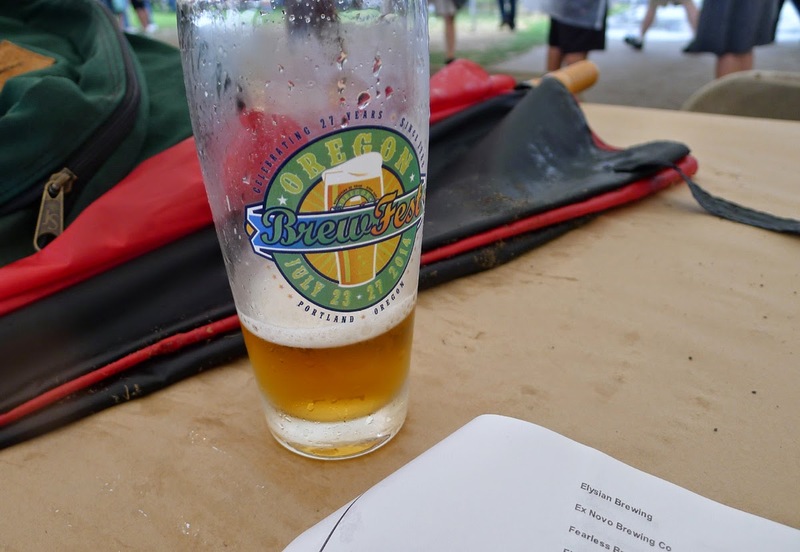 Like every other beer geek at the festival, I had a list of beers I hoped to try...and I got around to tasting most of them. One of the really dumb things about recommending beers is that most who do have not tasted everything these is to taste. I tasted maybe 20 beers, leaving 68 on the table. That's the say nothing of the Specialty Tent, where I tasted a single beer, which was excellent. For hopheads, there's Ballast Point's Sculpin IPA, which is well-known around these parts. More adventurous folks are going to want to sample Heathen's Megadank, a juicy hop bomb that packs 120 IBU (without being all that bitter) and 8.2% ABV. Heathen's Rodney Stryker told me the ABV is closer to 9.0, which sounds right. Another not-to-be missed beer in the style is Central City Brewing's Red Betty. Central City, located in Surrey, B.C., puts Red Betty in the Imperial IPA category, but it's really an imperial red, I think. Malty and hoppy at the same time, and nicely balanced along the way. There's also Payette Brewing's Blood Orange IPA, which seemed to strike a nice balance between hoppy and tart. In the "everything else" category, there are a lot of fruit beers in various styles. From that list, I enjoyed Elysian's Perfesser, a Belgian Blonde Ale fermented with plums and Brett. It features aromas and flavors of plums, figs and raisins in a medium body and is delicately tart. Logsdon's Straffe Drieling, a Belgian-style Tripel flavored with Hallertau hops and blended with organic pear juice during secondary fermentation, is excellent. I really wanted to like Paradise Creek Brewing's Huckleberry Pucker, a flavored Berliner-Weisse. But I found the huckleberry presence overwhelming and out of balance. Others liked it, so be my guest and give it a try. If you're wondering why I wanted to like the Paradise Creek entry, it's because the brewery is located in Pullman, Wash., home of my Alma mater, Washington State University. Go Cougs! As I was sitting down to write this, I figured the weather would be improving. Then I took the Labs out for their morning run and experienced light rain. It may turn out that the shift to warmer weather is slower than predicted. 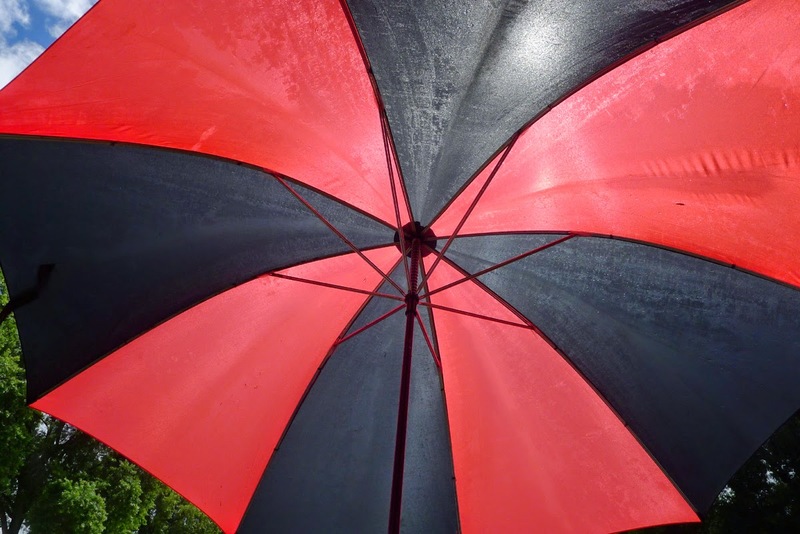 We may be looking at a mushy day today followed by three warm and dry days. If that's the way it turns out, it's going to be a busy weekend at the festival. Friday and Saturday are historically the most crowded days and the wacky weather yesterday and today will likely magnify that tendency. My advice? Get to the park early and get your fill of beers on the south side as quickly as you can. Then move to the north side, which always tends to be less populated. There are plenty of good beers on both ends, to say nothing of the Specialty Tent. I'll be back at the festival on Friday and Saturday, and will be signing copies of my book on Portland's beer history near the south tent. Naturally, I'll be doing some additional beer sampling, as well, just to stay limber. Stop by and say hello if you're passing by.